A Rivers State High Court presided over by the Chief Judge of the state, Justice Adama Iyayi-Laminkara, has adjourned to November 29 hearing in a libel suit brought against the Director-General of the Nigerian Maritime Administration and Safety Agency (NIMASA), Dr. Dakuku Adol Peterside, by former Rivers State Governor, Dr. Peter Odili. 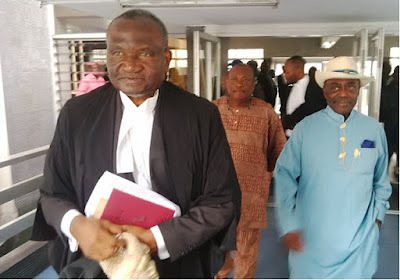 Odili had in the N6 billion suit accused Peterside, who was the governorship candidate of the All Progressives Congress (APC) in the 2015 general elections in the state, of defamation of his character by a statement made after Governor Nyesom Wike’s thanksgiving service after his Supreme Court victory. Odili said Peterside alleged in the press conference that Wike, during his victory thanksgiving service, stated that he (Odili) helped him to secure the Supreme Court victory. Odili stated that what the APC governorship hopeful said was false and malicious, as Wike never made such an inference, but that Peterside twisted and misrepresented what the governor had said. At the first hearing of the suit on October 11, neither Peterside nor his counsel was in court. But at the resumed hearing on Thursday, counsel to the NIMASA boss, Rowland Otaru, who stated that they were not in court on October 11 because they were not properly served, prayed the court for an adjournment to enable them file their defence.